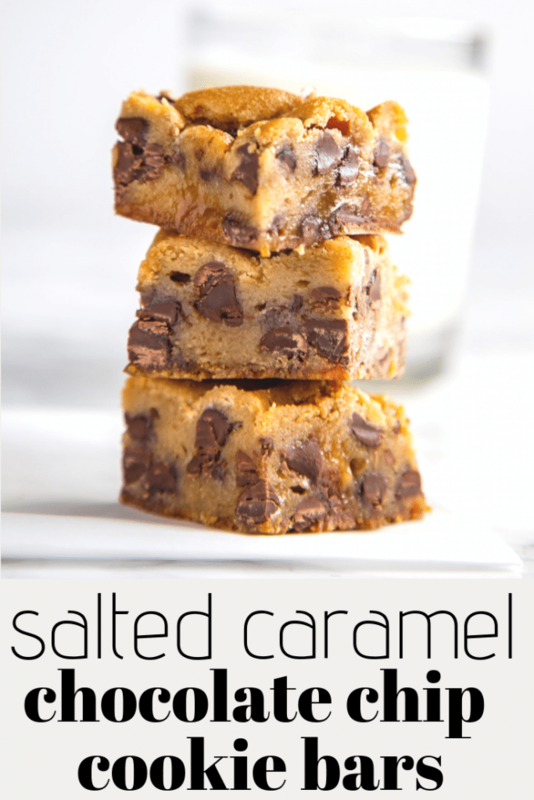 Homemade salted caramel sauce sandwiched between layers of chocolate chip cookie dough and topped with sea salt flakes. Cookie bar perfection! I’ve always enjoyed twists on classic desserts. Chocolate chip cookies are one of the quintessential American desserts – there are recipes on the back of every chocolate chip bag. 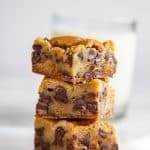 One day my husband asked me to make a dessert for him to take into a work potluck and suggested chocolate chip cookie bars. I had been experimenting with homemade caramel sauce and had some extra caramel sauce in the fridge. Since chocolate + caramel is always a tasty combination, I decided to pour the caramel in between layers of chocolate chip cookie dough. 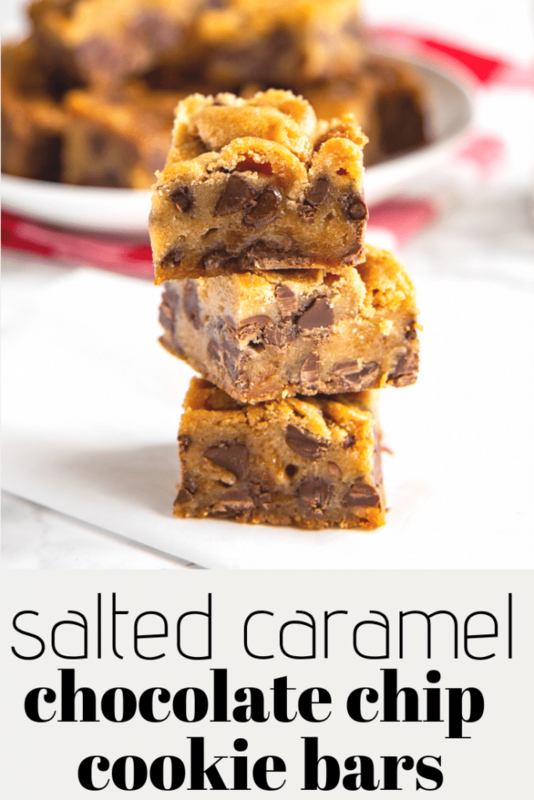 The result is these caramel filled chocolate chip cookie bars topped with sea salt flakes. Start by making the caramel sauce (or you can use store-bought caramel instead). Place the caramel sauce in an airtight container in the fridge and allow it to cool and thicken. Preheat the oven to 375 degrees F (190 degrees C). Line a 9″ x 9″ or similar sized pan with foil. Make sure the foil goes all the way up the sides, you’ll use it later to help get the finished bars out of the pan in one piece. Spray the foil with cooking spray. Then prepare the chocolate chip cookie dough. Using a mixer, beat the butter and sugars over medium speed until creamy. Add the vanilla extract, eggs, baking soda, and salt, and mix on low speed until just incorporated. Then add in the flour and mix on low speed until there are no more white streaks. Take the bowl off of the mixer and add in the chocolate chips, stirring with a large spoon or your hands. Add half of the cookie dough to the prepared pan. Press into the bottom and corners. Pour the caramel sauce on top of the cookie dough. Sprinkle the caramel with sea salt flakes. Then drop the remaining cookie dough on top of the caramel in small chunks. If the pan seems full, reserve some of the dough to bake as cookies later just so it doesn’t overflow. Place your pan on a rimmed baking sheet to catch any possible overflow. 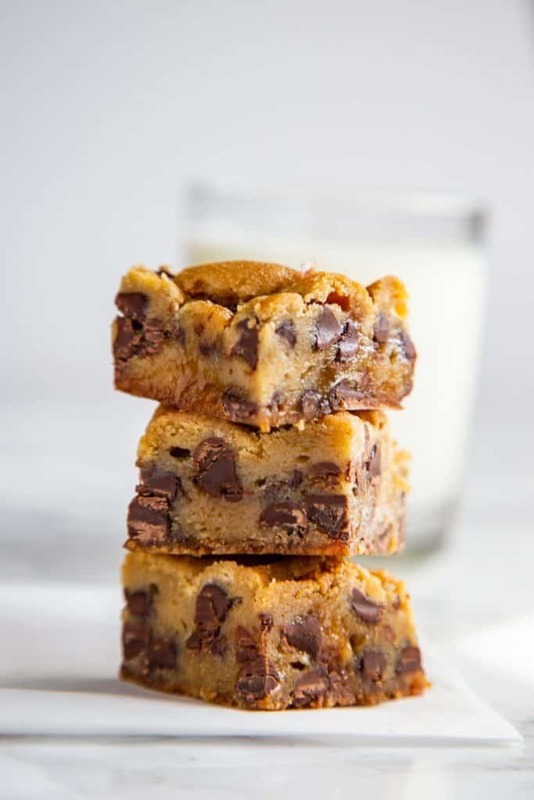 Bake for 40-50 minutes until the cookie bars are golden brown and cooked through. Cool the bars for 1 hour on a cooling rack. Then, using the foil, lift up the bars and place on a large plate. Cool in the fridge for another hour. You can also cool the bars in the fridge in the pan, but it makes it harder to remove from the pan later. Once cooled remove them from the fridge, peel off the foil, and cut into small squares. I’ll often cut off a 1/4″ off around the sides and discard (or taste test…) to give the finished bars cleaner edges. You can make both the caramel and the cookie dough a few days ahead. Store the caramel in an airtight container and cover the cookie dough with plastic wrap in the fridge. Take both out of the fridge about 30 minutes before you’re ready to assemble and bake. This post may contain affiliate links. See my disclosure policy here. A good mixer makes mixing up these cookies a breeze. I’ve had this KitchenAid mixer for years and it’s still going strong. High-quality sea salt makes the salted caramel even better. My favorite finishing salt is this Jacobsen sea salt, my husband brought some back after a trip to Oregon and I’ve been buying it ever since. Most grocery stores will stock sea salt flakes as well. Looking for more caramel dessert recipes? Try these Mini Caramel Apple Cheesecakes or No Churn Caramel Swirl Ice Cream. 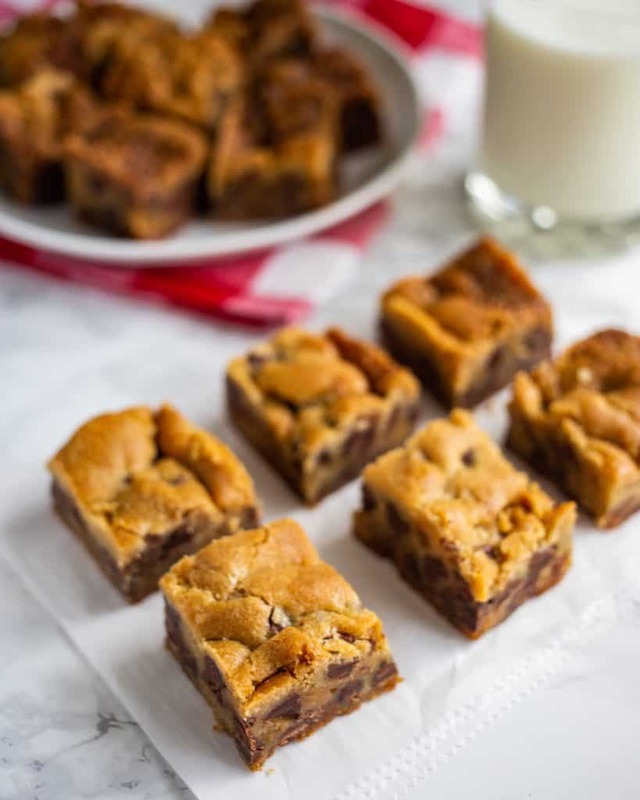 If you try these salted caramel chocolate chip cookie bars, leave a comment and review below and let me know how they worked out for you! Preheat the oven to 375 degrees F. Line a 9x9 square pan with foil, make sure the foil goes up the sides as you'll use it to help you get the bars out of the pan. Spray the foil with cooking spray. Add the softened butter, granulated sugar, and brown sugar to a large mixer bowl and beat over medium speed until creamy. Add the vanilla extract, eggs, baking soda, and salt. Mix on low speed until just incorporated. Add the flour and blend in over low speed until mixed through. Remove the bowl from the mixer and stir in the chocolate chips using a large spoon or your hands. Add half of the chocolate chip cookie dough to the pan, press into the bottom and sides. Pour the caramel sauce on top. Sprinkle the caramel with salt flakes. Then drop the remaining chocolate chip cookie dough on top. See note below if you don't have a very tall pan to prevent overflow! Places rimmed baking sheet under the 9x9 pan and place in the oven just in case it overflows. Avoid overflow by using a deep pan and keeping some of the dough aside to make a few cookies later. Bake for 40-50 minutes until the cookie dough is golden brown and cooked through. Allow to cool on a cooling rack for 1 hour. Then remove from the pan using the foil sides and place on a large plate. Refrigerate for another hour before removing the foil and cutting into pieces. The 9x9 pan that I used was 2.5” high. If your pan isn’t quite that deep, then reserve a small amount of cookie dough and make a couple of cookies later just to make sure it won’t overflow. To be extra safe if this is your first time making them, bake with the pan on top of a cookie sheet to catch any possible overflow. I have not had any issues with overflow myself but did have one reader that did, so I don't want it to happen to you! The cookie dough and caramel sauce can be made several days ahead. Place the caramel sauce in an airtight jar and cover the cookie dough with plastic wrap before refrigerating. Then take out of the refrigerator about 30 minutes before using. I’m a big fan of caramel so love the idea of adding it along with chocolate chips. Looks yummy! These would not last long in my house! I need these bars in my life! They look amazing! I love the salted caramel flavors! These look absolutely decadent and something I would eat the whole pan of. These look so mouth melting. Cant wait to eat them all. I am drooling with the thought of Salted Caramel Flavor and Chocolate Chips. Did you mean a 9×13 pan? I was even short a full cup of caramel sauce and this cooked over the sides of my baking dish onto the bottom of my oven. Oh no! I’ve made them so many times and never had that problem. I’ve been using a 9″x9″ glass Pyrex pan, I wonder if it’s taller than the one you used? Just measured and it’s 2.25″ tall. Let me know about your pan so I can add some comments to the recipe to help others. My pan is also Pyrex but with 2 inch sides. I’ll have to try it again in a deeper pan because I think they would have turned out incredible! These did not turn out at all. I used a 8×10 baking dish (with 2” sides). I also used the 2 c of purchased caramel sauce which my instinct told was way too much. After 50 mins they were total liquid and over browned on top. Had to throw them away. They also totally cooked over the top of the dish. Was very glad you suggested the sheet underneath since that saved my oven from a major mess. Too bad, these looked so good! I was going to serve them for a brunch and blog them with credit back to your site. Oh well, if you try a lot of recipes like I do, a few are not going to work out for one reason or another. These look so good! Can’t wait to try them this weekend! That salted caramel is SOOOOO good. 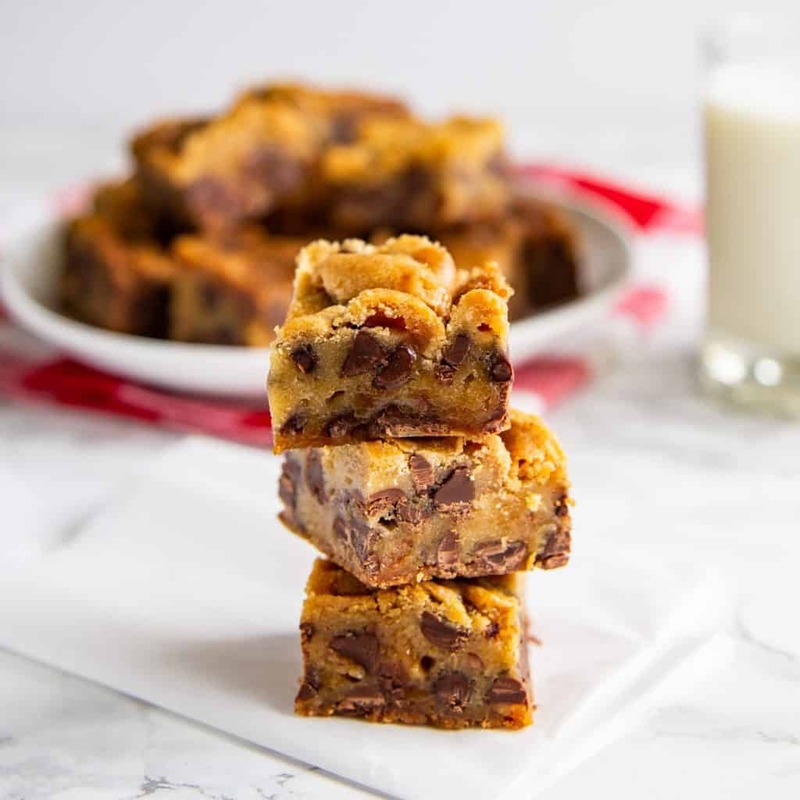 These cookie bars were my husband’s favorite – thank you!! These look SO good! I love how they actually have that caramel color to them. These might even be good with a sprinkle of sea salt on top! These look so delicious and so moist! Love these!